Paper-pieced hearts and smaller pieced and appliqued units make up the blocks in this scrappy quilt. 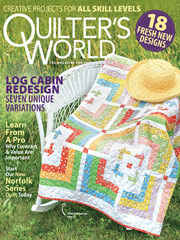 This e-pattern was originally published in the February 2011 issue of Quilter's World magazine. Size: 51" x 61 3/4". Block Size: 7" x 10 3/4", 3 3/4" x 10 3/4".